The Steelers cut Jeff Reed today, after 8½ eventful seasons. We say goodbye to the boozing, the blowout, and, yes, the dong. Join us, won't you? 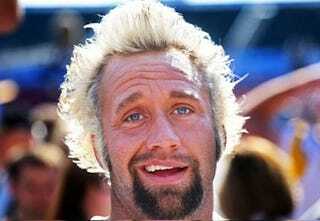 Jeff Reed was the first athlete dong to be featured on Deadspin, sparking a trend that continues to this day. According to the tipster, Reed had been shot down by a couple of women at a bar, so he retreated to his hotel bathroom to take this photo to send them. It did not help him get laid, but it did announce the emergence of a special kind of kicker onto the scene. This one... is for the ladies. Just a few months later Reed returned to our radar. Shirtless and rocking the blowout, he predated the Jersey Shore trends by two years. Yet we get the feeling this wasn't him playing dress-up, but rather a normal night out. Later that year Reed was again spotted in his natural habitat, drink in hand, hand on crotch. Reed later took his schtick outside, yet little else changed. Sure, the women had bikinis, and sure, he looked like a pretty pretty princess in his tiara, but Reed himself was the same lovable scamp. It would be a magical season. Hey, the shirt's back! So is the hair! This was five nights before the Super Bowl, by the way. Reed's two field goals were the difference in a 4-point game. The conquering hero, Reed could have anything he wanted: wine, women or song. He went with the nachos with everything. A man cannot be on top of the world for long before the haters try to take him down. In this case, a gas station bathroom paper towel dispenser, which dared to be empty when Reed needed to dry his hands at 3 a.m. Reed had made a paid appearance at a Pennsylvania bar earlier in the night (he showed up "late and visibly drunk"), and the paper towel dispenser paid the price. He later pleaded guilty to a charge of criminal mischief. More trouble soon followed. Immediately after a game, Reed crossed the Heinz Field parking lot to hit a bar, where a teammate was busted for public urination. Reed confronted police trying to ticket the teammate, and attempted to fight them. He was handcuffed and charged with drunk and disorderly conduct and resisting arrest. He would serve 40 hours of community service. Eccentricity can be tolerated if you're good. But Reed was getting less distance on his kickoffs and missed seven field goals this year, including a 26-yarder against New England on Sunday. That was enough for the Steelers, who cut him despite having given him the franchise tag. There are 31 other teams, and six more in the UFL, so we're sure Reed will land on his feet. And since he's got a journalism degree, there's always a seat for him here at Deadspin.